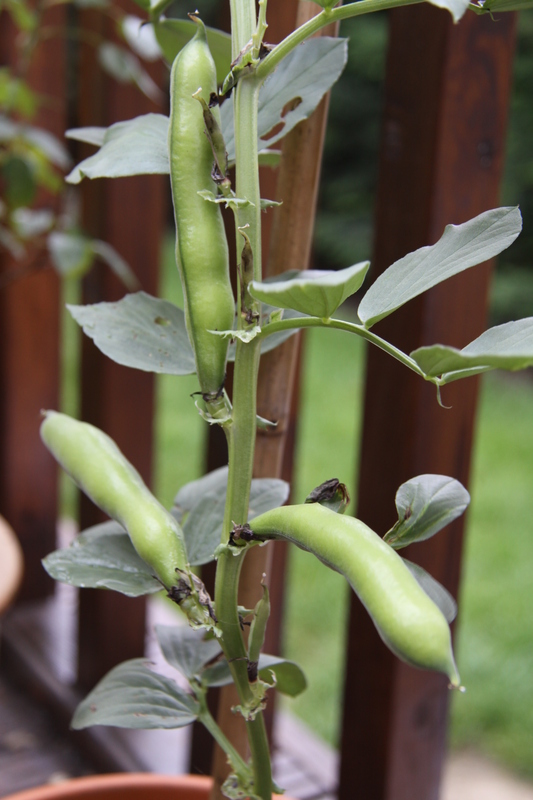 A few months back my daughter came home with a tiny broad bean plant she’d planted at school. They had planted it in some soil inside a pot fashioned out of newspaper – very ingenious. We placed it on our kitchen window sill (a nice sunny spot) and kind of just left it, or rather, forgot about it, only remembering to water it occasionally until suddenly – in spite of the lack of adequate attention – it had turned into a bona fide plant. Still small but encouraging enough to re-plant into a larger pot which again we left on the window sill until it grew bigger and started to flower. At this stage- having no knowledge about growing vegetables I was starting to wonder where on earth the broad beans were? Maybe it’s just me but I subsequently discovered I was a complete ignoramous when it came to knowing how on earth vegetables grow, their sowing, planting out and harvesting time frames, etc. It’s a whole science in itself! However, I got talking to an organic gardener when I was at my yoga retreat in April who advised me that we were on the right track and that all that was now required was patience! And as you can see from the photo above, our patience was rewarded with a small “harvest” of big fat broad beans once we had transferred the plant into a larger pot in our garden. It has been the subject of much fascination in our household, both among my children and myself and partner too. My dad used to have an allotment when I was little so I don’t quite know why I feel I’d never seen vegetables growing like this- other than maybe I was too busy running around with my brothers and sister to spend any time paying attention to what my dad was doing. In any case, we have watched in child-like fascination as bean after bean has come sprouting out of this plant- even now they are still coming although at times it seems to be a competition between us and the creepy crawlies and who can get to the beans first!! This, for me, is definitely the “low-light” of organic vegetable gardening….. Inspired by my daughter’s broad bean plant I bought myself a wonderful book (see pic below) on how to grow vegetables and fruit in containers/pots as we only have a small garden and no space for a vegetable patch and on the basis of the information I found I also promptly bought myself some small pots and a variety of seeds. My foray into “growing my own” has been very much a case of trial and error but something the whole family has been able to enjoy. At this stage with only a small amount of produce being grown the pleasure is truly in watching the plants develop and the vegetables emerge rather than really benefitting us in terms of saving on our food bills, although having said that my little pots of spinach and rocket which grow very quickly have meant I haven’t had to buy these from the shops in quite a while. I am also growing radishes, tomatoes, carrots, strawberries, mint, basil and chilies and all are growing with varying degrees of success. ;-) I’m making it sound like I have a huge allotment or something but in reality this is all happening in small to medium-sized pots and troughs on our decking area and steps and as they are starting to take over somewhat, my other half has suggested getting a small greenhouse – well, with the area we would have for our greenhouse it would be more like a green “cupboard”, but something to protect the plants over the frostier months. All in all this has been and is a very enriching- “back-to-nature” experience and a learning experience too and something I would definitely recommend for anyone wishing to dip their toes (or should that be fingers (?)) into organic gardening. And while I wouldn’t quite say I’m green-fingered yet, I have to admit I am enjoying ‘tending to my flock’ each morning ;-) but most of all that my children are learning a lot too, particularly that vegetables and fruit don’t grow in supermarkets!! If I have inspired you a little to find out more about “growing your own” I would definitely recommend the book in the picture above and another one I am also using – I will put links to these in my “On my Bookshelf” section shortly if you are interested in more details. The broad beans are amazing, wouldn’t mind trying to grow some of them! Hi there, I discovered your website by way of Google at the same time as searching for a similar subject, your site came up, it appears to be like great. I’ve bookmarked to favourites|added to bookmarks. Previous Post Sun, sea, sand and … yoga! Next Post Deer in headlights!